Shouldn’t they recuse themselves when dealing with the Middle East? It was a question combined with a comment that I have heard many times before and my answer is always the same: any organization that aspires to be heard on foreign policy knows that to touch the live wire of Israel and American Jews guarantees a quick trip to obscurity. Jewish groups and deep pocket individual donors not only control the politicians, they own and run the media and entertainment industries, meaning that no one will hear about or from the offending party ever again. They are particularly sensitive on the issue of so-called “dual loyalty,” particularly as the expression itself is a bit of a sham since it is pretty clear that some of them only have real loyalty to Israel. Most recently, some pundits, including myself, have been warning of an impending war with Iran. To be sure, the urging to strike Iran comes from many quarters, to include generals in the Administration who always think first in terms of settling problems through force, from a Saudi government obsessed with fear over Iranian hegemony, and, of course, from Israel itself. But what makes the war engine run is provided by American Jews who have taken upon themselves the onerous task of starting a war with a country that does not conceivably threaten the United States. They have been very successful at faking the Iranian threat, so much so that nearly all Republican and most Democratic congressmen as well as much of the media seem to be convinced that Iran needs to be dealt with firmly, most definitely by using the U.S. military, and the sooner the better. And while they are doing it, the issue – that nearly all the Iran haters are Jewish – has somehow fallen out of sight, as if it does not matter. But it should matter. A recent article in the New Yorker on stopping the impending war with Iran strangely suggests that the current generation of “Iran hawks” might be a force of moderation regarding policy options given the lessons learned from Iraq. 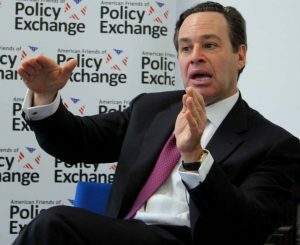 The article cites as hardliners on Iran David Frum (pictured), Max Boot, Bill Kristol and Bret Stephens. And I would add a few more names: Mark Dubowitz, Michael Ledeen and Reuel Marc Gerecht of the Foundation for Defense of Democracies; Daniel Pipes of the Middle East Forum; John Podhoretz of Commentary magazine; Elliot Abrams of the Council on Foreign Relations; Meyrav Wurmser of the Middle East Media Research Institute; Kimberly Kagan of the Institute for the Study of War; and Frederick Kagan, Danielle Pletka and David Wurmser of the American Enterprise Institute. And you can also throw into the hopper entire organizations like The American Israel Public Affairs Committee (AIPAC), the Washington Institute for Near East Policy (WINEP) and the Hudson Institute. And yep, they’re all Jewish, plus most of them would self-describe as neo-conservatives. And I might add that only one of the named individuals has ever served in any branch of the American military – David Wurmser was once in the Navy reserve. These individuals largely constitute a cabal of sanctimonious chair-borne warriors who prefer to do the heavy thinking while they let others do the fighting and dying. So it is safe to say that much of the agitation to do something about Iran comes from Israel and from American Jews. Indeed, I would opine that most of the fury from Congress re. Iran comes from the same source, with AIPAC showering our Solons on the Potomac with “fact sheets” explaining how Iran is worthy of annihilation because it has pledged to “destroy Israel,” which is both a lie and an impossibility as Tehran does not have the resources to carry out such a task. The AIPAC lies are then picked up and replayed by an obliging media, where nearly every “expert” who speaks about the Middle East on television and radio or who is interviewed for newspaper stories is Jewish. One might also add that neocons as a group were founded by Jews and are largely Jewish, hence their universal attachment to the state of Israel. They first rose into prominence when they obtained a number of national security positions during the Reagan Administration and their ascendancy was completed when they staffed senior positions in the Pentagon and White House under George W. Bush. Recall for a moment Paul Wolfowitz, Doug Feith, and Scooter Libby. Yes, all Jewish and all conduits for the false information that led to a war that has spread and effectively destroyed much of the Middle East. Except for Israel, of course. Philip Zelikow, also Jewish, in a moment of candor, admitted that the Iraq War, in his opinion, was fought for Israel. Add to the folly a Jewish U.S. Ambassador to Israel who identifies with the most right-wing Israeli settler elements, a White House appointed chief negotiator who is Jewish and a Jewish son-in-law who is also involved in formulating Middle East policy. Is anyone providing an alternative viewpoint to eternal and uncritical support for Benjamin Netanyahu and his kleptocratic regime of racist thugs? I think not. There are a couple of simple fixes for the dominant involvement of American Jews in foreign policy issues where they have a personal interest due to their ethnicity or family ties. First of all, don’t put them into national security positions involving the Middle East, where they will potentially be conflicted. Let them worry instead about North Korea, which does not have a Jewish minority and which was not involved in the holocaust. This type of solution was, in fact, somewhat of a policy regarding the U.S. Ambassador position in Israel. No Jew was appointed to avoid any conflict of interest prior to 1995, an understanding that was violated by Bill Clinton (wouldn’t you know it!) who named Martin Indyk to the post. Indyk was not even an American citizen at the time and had to be naturalized quickly prior to being approved by congress.